One of my favorite soups ever, is potato soup. Not just any potato soup, though. It HAS to be homemade. I've tried many different brands of canned potato soup. They just aren't the same. My favorite homemade recipe, Delicious Ham and Potato Soup, is found on allrecipes.com. I like the versatility of the soup, I like that it is quick to make, and I LOVE the flavor! Sorry about the poor quality of this picture! It was really dark & I tried to lighten it up... a lot. As much as I love this recipe, I don't think I have ever followed it 100%. I like to add a lil' of this and a lil' of that. This time, I added crumbled bacon, chopped carrots, and a couple cloves of garlic. I used a little more of "this" and a little less of "that", depending on what I had. I also used a little bit of bacon grease in the roux. This batch was slightly thinner than I usually like it (I added too much milk... oops! ), but the flavor was awesome! Sometimes, I will cheat a bit. I get a big ol' bowl and throw in the cut up potatoes, celery, carrots (recipe doesn't call for carrots, but I love them! ), and the water and throw them in the microwave to cook. Half way through, I will add the ham. While that is cooking, I saute the onion and garlic (I always add garlic, too). Then, I start the roux in the same pan. When the potatoes/veggies are finished cooking, I will add the bouillon and salt & pepper, then pour the mixture into the roux and let it simmer a bit longer. Now, I don't know if the veggies actually cook faster in the microwave, but it makes me feel like I dirtied less pots and pans and got the soup on the table quicker... either way, it still tastes just as good, so it doesn't really matter much! Edit: I drafted this post last week, and it's been sitting here waiting for me to publish it. For Easter, my husband took a cooked ham and gave it some extra flavor by smoking it on the grill. It was sooo yummy! I made this soup with the leftover ham. YUM! This was the closest I've stayed to the recipe, only adding garlic and making the roux with a mixture of bacon fat and butter. It had a nice smoky flavor, but not too overpowering.Best. Soup. Yet! 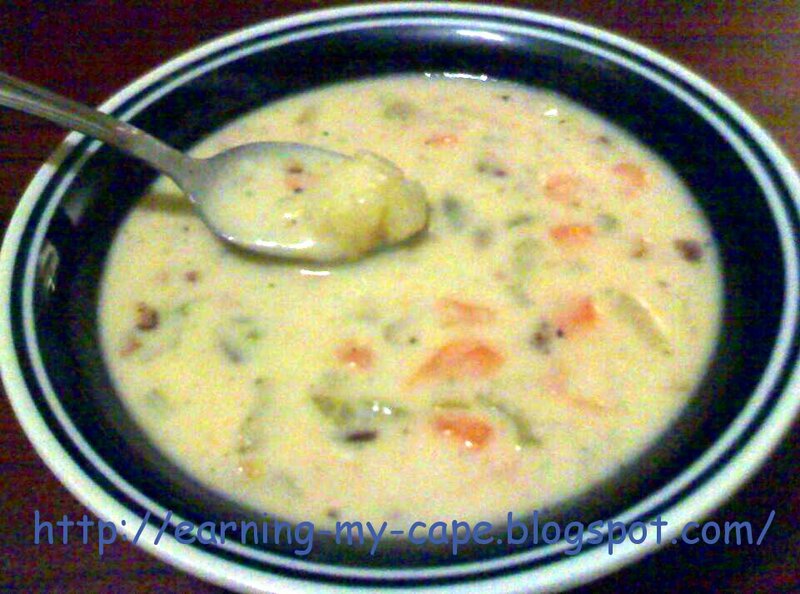 If you are a potato soup fan, I highly recommend trying this recipe! And if you have an equally awesome or even better recipe, I would LOVE if you'd share it! My family loves potato soup. Can't wait to try your version. Thanks for sharing!